Mormon Discussions • View topic - Cross, point, or angel on steeple? Cross, point, or angel on steeple? Post subject: Re: Cross, point, or angel on steeple? No, the 666 is the number of the beast, or the man who presides over it, the pope. One of the old papal crowns had this inscription on it; "DCLXVI." Albion, don't even think about it. You're way over your head here. However, if you're ready to get beat up again, at least read my post on "Understanding Revelation 13 by the Spirit" first! I hope that I will never see a cross on a Mormon temple since it is the "mark of the beast," of the sign of that apostate kingdom, and now represents apostate Christendom!!! Do you try to be a walking parody of Mormonism? Well, well, gdemetz, you didn't tell me you did comedy, too. Masonic and occultic symbols on the outside of Mormon temples, quasi masonic ritual inside which bears no resemblance whatsever to what went on in the temple of Israel.....let alone the very clear symbolism of the temple veil being ripped in two (Hebrews) indicating that even what what did go on in temples at the time of Christ was no longer necessary. Very dumb again Albion!!! Christ cleansed the temple, Albion, and called it his Father's house! Here we go again! I give you the truth from the Bible, and you give me evangelical BS!!! "And they continuing daily with one accord IN THE TEMPLE, and breaking bread from house to house, did eat their meat with gladness and singleness of heart." You made a good point this time , Drifting. We do not follow that counsel as we should. That is one reason we have so much heart trouble, etc. Are you aware that the LDS Church petitioned the Salt Lake City council in 1916 to erect a cross monument on Ensign Peak (sacred hill that had been identified as a "natural temple"), to honor the Mormon pioneers who were then quickly passing away? Why do you think that is? And why is Brigham Young's wife, Amelia Folsom Young, wearing the "Mark of the Beast" in the photo below? And did you know that the "mark of the beast" (or rather, cross) was perceived by Spencer W. Kimball as a sign, confirming to his heart that he was indeed called by God to serve in the Quorum of the 12? Why do you think that is? My book: Banishing the Cross: The Emergence of a Mormon Taboo. I'm confident that they didn't know any better, just as Peter didn't at first when he sided with the Jews who insisted that the gentiles be circumsized before baptism, until the Lord corrected him. I don't see any crosses now on the temples, etc., and if I ever do, I will petition the first presidency to tear it down. I don't see any crosses now on the temples, etc., and if I ever do, I will petition the first presidency to tear it down. 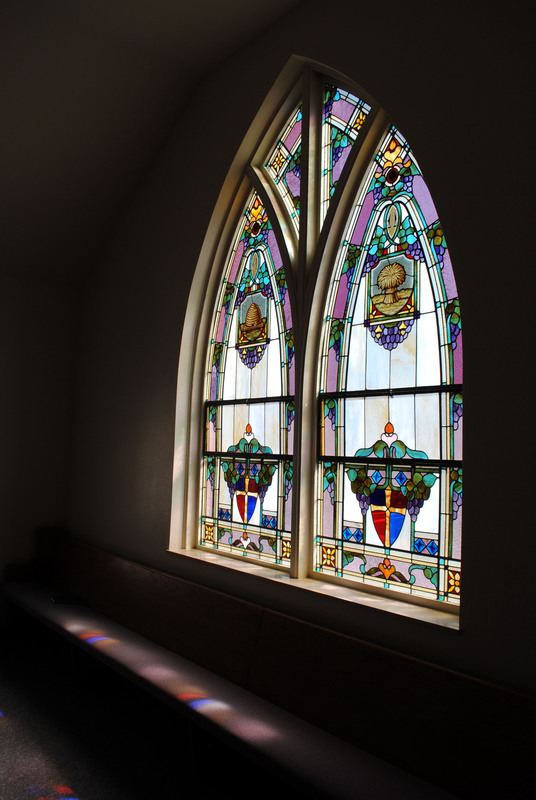 So why don't you petition the first presidency to remove the crosses on the shields in the stain glass from the Salt Lake Liberty Ward (1908-1924) chapel? And why don't you also take it up with God, asking him why he answered Elder Kimbal's prayer (about joining the Quorum of the 12) with a cross? Please let me know the response you get. Thanks. Image I designed for a friend's website. Things are certainly getting confusing... Christ hung on a cross. God turned that vial object of torture into a sign of salvation. Some feel the display of such is wrong and others feel that there is something wonderful in it presents. I feel it may reveal the heart of the individual. Scriptures indicate to me that the words "the cross" are a legitimate means of referencing the sacrifice of Jesus. However, these words are perhaps only a reference to the sacrifice of Jesus, not a reference to the Church or the commandments or the teachings or the Birth of Jesus, or the Resurrection of Jesus, or the rest of the story, the things which help us to know about Jesus and understand the significance of that sacrifice. Is the cross an advertisement for those things? In the text, it is only understood alongside the character and nature of Jesus, and that understanding is necessary first. In terms of a physical symbol of that sacrifice, I don't think God ever said physical symbols of His death are to advertise. Instead, physical symbols are specified and used in ordinances and play a functional role. This is the case in the Old Testament where firstlings were sacrificed "in a similitude of the sacrifice that would be made of the Only Begotten Son of God" (LDS Bible Dictionary), and in the New Testament, where "as often as ye eat this bread and drink this cup, ye do shew the Lord's death till he come" (1Cor 11:26). This does not minimize the cross. Jesus has the prints of the nails in his hands and in his feet. It is necessary to understand the sacrifice he made. But He is not dead, He is not dying, He is Risen! In terms of a physical symbol of that sacrifice, I don't think God ever said physical symbols of His death are to advertise. Did God ever say that the Christus or angel Moroni statues "are to advertise"? But He is not dead, He is not dying, He is Risen! Mormons believe that Joseph Smith's work did not end at his death either. Why then is it acceptable in Mormon culture for Mormons to treat Carthage as sacred space? Why do Latter-day Saints visit the place of martyrdom, and report having spiritual experiences therein? What does it matter? All are symbols of beliefs that create the disease and then peddle the cure. 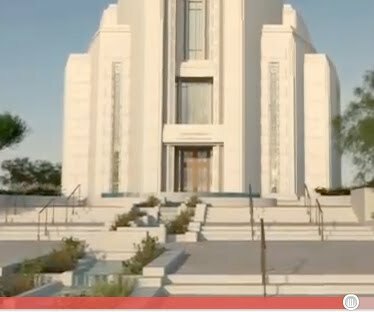 From the cgi video for the temple being built in Rome. Notice anything on the door? Ha! I thought I had seen this before. I am suppose to make a trip to Salt Lake in September, and I intend to bring this to the attention of the first presidency. Nipper, Christ's death was a necessary thing for us all, but the cross is not our salvation, Christ is. The cross is the horrible instrument of torture used by the "beast" to torture the saints as well as others they considered their enemies. In fact, it is the "mark of the beast," or sign of that kingdom! If you look up "Bishops of Rome under Constaintine I" in Wikipedia, you can see a painting of him handing authority (his crown) to Sylvester! "And it (the Catholic church) exercised all the power of the beast (kingdom - Rome) before it." you and the first presidency hang out a lot together do you? Not really. By the way, in the same above reference, you can see the painting of the emperor getting the inspiration for the mark of the beast. Sometimes, when we are in no hurry, yes. The Angel Moroni is not a symbol of His death, but a symbol of the restoration of the gospel. The Christus depicts the nail marks in Christ's hands and feet, marks whose explicit purpose as explained by Christ is to advertise the sacrifice He made and to bear witness that He is God. See 3 Nephi 11:14-17. Seeing the prints on the resurrected Savior puts the sacrifice in context. But remember, I'm not minimizing the cross. It's important to understand that Christ died for us, and a cross can remind us of that; however it has become so widely used that for us it may be difficult to consider the issue objectively. So let's look at this in a way that removes the cultural traditions. The cross is a visual depiction. Let's replace that visual with something comparable of an auditory nature, such as the sound of a man being tortured on a cross, gasping for breath and crying out. Would it be appropriate for a Church to record that sound and play it each time someone enters through the doors? Or to make it the official sound of the Church and play it constantly in the background during service? Carthage proves that the Prophet's testimony was sealed with his blood. That fact is sacred even though the physical act of him being murdered was not sacred. And Carthage itself did not kill him, it merely bears witness.